Graham revisits the Braille scale with a deep incursion in RAAF history. This time he brings Us this fabulous rendition of 42nd Squadron RK-E Catalina and the great story of its last flight. It was January 1945 and the monsoonal season already kicked off at Darwin, Australia. As air operations decreased due to faulty weather conditions, the 42nd Sq. 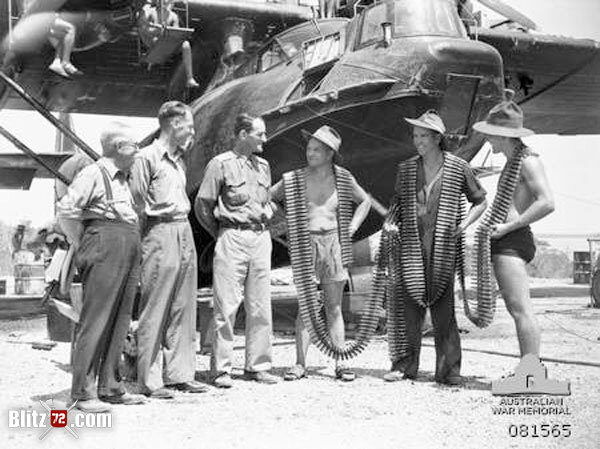 RAAF PBY Catalina crews were enjoying a much needed rest away from their usual mining missions. 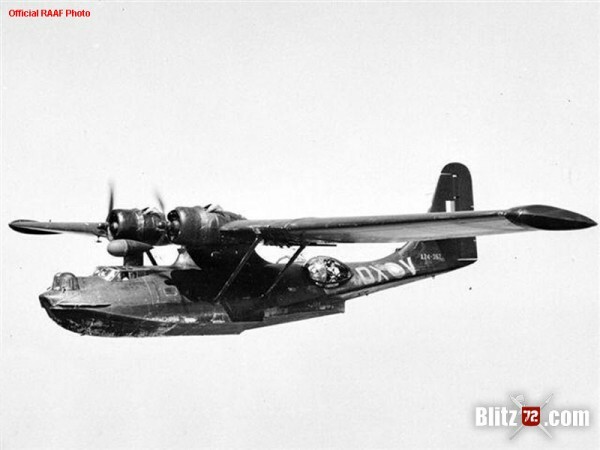 During the last months of 1944, the 42nd Squadron PBY-5A Catalinas were restlessly mining the numerous straights and channels of the Java Sea and deny its use to the Japanese Imperial Navy shipping operations. 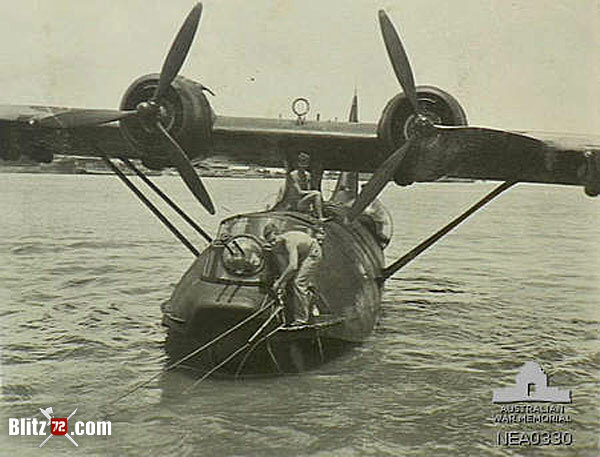 With their excellent long range capability, the PBY-5As excelled at these rather hazardous tasks. In fact, the 42nd Squadron kept an operational tempo so hectic that they were overstraining their maintenance schedule. However, as most of the regular maintenance tasks and repairs were done in the open, the ground crews and mechanics didn’t had an easier time, not even during the rainy season. Flight Lieutenant Harrigan and his crew were enjoying some time off in the base when they were called in by their Commander along with other PBY-5 crews. In the briefing rooms they would be informed. 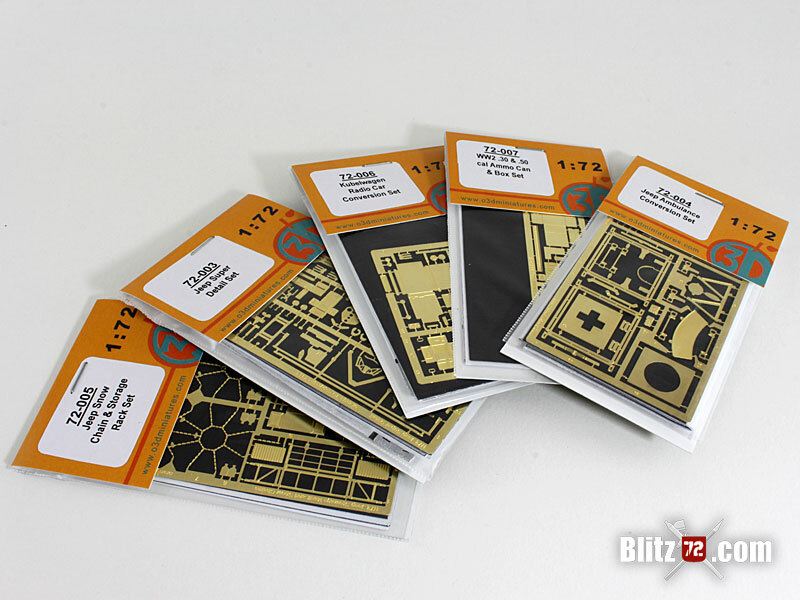 -“An important mission has been presented to Us in the Surubaya Sector…”. Surabaya. That place was not unfamiliar at all to Harrigan or any of the 42nd Squadron pilots. They have been regular visitors on mining missions in the past, and in fact they had plans to further mine it when the Monsoon season was over… but why the rush?. “A POW escaped captivity and passed fresh Intel on the Japanese movements in the area…” continued the Commander while pointing a place on the map, “It seems the Japanese managed to buoy a channel in between the mines from the North West entrance of the channel and they have been merrily sailing along while we have been trying to keep our undies dry. Time to ruffle our feathers gentleman!”. On the night of 14th January, 1945, the small formation of RAAF PB5-5A Catalinas left Darwin and proceed Northwest to Surabaya. Weather was not playing on their side that night, a heavy cast forced the formation to go below 300ft to avoid any potential collisions. Other than that, everything was going well until some 780 miles off Darwin and just North of the Sumba Island, Flt Lt Harrigan’s Black Cat, coded RK-E, started to purr… but in a bad way. It all began with the port engine spluttering at first but then it went to a full stop. With a fully loaded plane, an engine out at 300ft over the sea, in foul weather and in full radio silence, Flt Lt Harrigan had to think fast while struggling to keep altitude. The Co-Pilot double checked for the usual problems then went to restart the engine. No dice… they were slowly but surely going down. At arround 200 Ft, Harrigan ordered the stores to be Jettisoned, but the airplane still wouldn’t recover itself, even with the Starboard engine in full auxiliary power it kept loosing altitude. Flt Lt Harrigan steered the plane against the wind as much as he could and ordered “BRACE FOR IMPACT!”. Flt Lt Harrigan did his best to flare the Cat so it would low its speed before going “on the step” in the water, but they were coming in too steep and too hot so the bottom of the Catalina slammed the surface of the sea like a furious fist on a table. – “…water all over here mate…”. The crew was ordered to fill the gap the best they could using any means necessary and start balling with a manual pump. Meantime the flight engineer and the co-pilot went out and started working on the Port engine. Hours and quite a few failed restart attempts later the crew heard airplanes flying overhead. Assuming there would be no point in maintaining radio silence anymore, the Navigator was ordered to contact them. 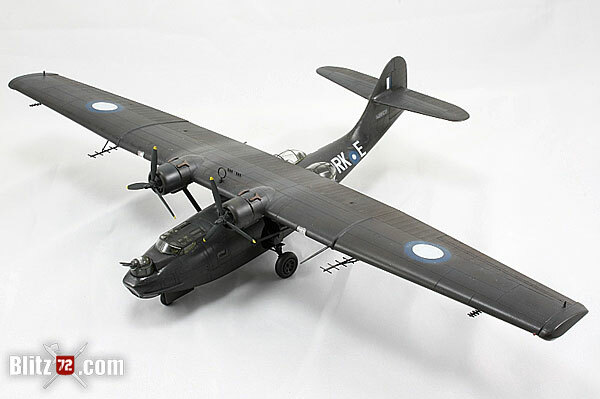 The rest of the Catalina’s returning from the mine laying mission were given the position of the downed aircraft, but since they were very low on fuel, and given the lighting and weather conditions they could not rescue their fallen brethren. Morning came and the crew kept taking turns in the balling pumps while the Flight Engineer kept trying to make the engine start. One of the crews took turns at the top of the wing with a set of binoculars to look for any ships, and most importantly, to determine if that would be good or terrible news as the Japanese Navy was known to still operate in the area. Then the most incredible sight, a Black Cat with blue and white roundels came and started circling the downed Catalina. 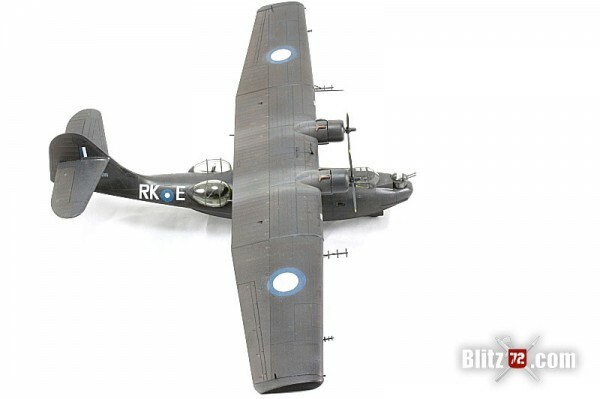 It was a 43rd Squadron airplane flown by Flt Lt Ortlepp and it was escorted by a RAAF B-24 Liberator. With a lighter aircraft, better lighting and improved weather conditions, Flt Lt Ortlepp did a much better job at dealing with the heavy swell and he brought the Catalina meters of Harrigan’s bird. It was determined that RK E was not flyable with the amount of water on board, and as such Harrigan’s crew boarded the 43rd Sq. bird. Just after taking off, Ortlepp circled over the listing Catalina barely keeping afloat and ordered his waist gunner to destroy the downed ship. A few bursts of .50 was all it took and the PBY-5 went into a huge orange fireball. It was a bittersweet feeling for Flt Lt Harrigan as he had lost his plane, but he couldn’t ask for more as all his boys were coming back home sound and safe. Graham skills should be no news to blitz72.com regular visitors as not long ago he published his outstanding 1/72 Italeri JU-88 A-4 with a mind blowing squiggle camo. 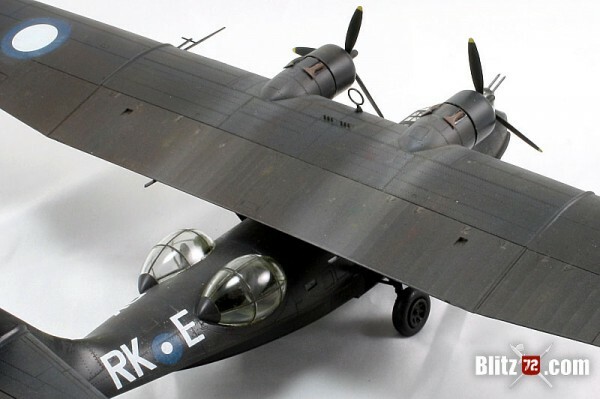 As if we recovered from that model already he wants to share his RAAF PBY-5A Black Cat model representing serial no. A24-96, code RK-E of No. 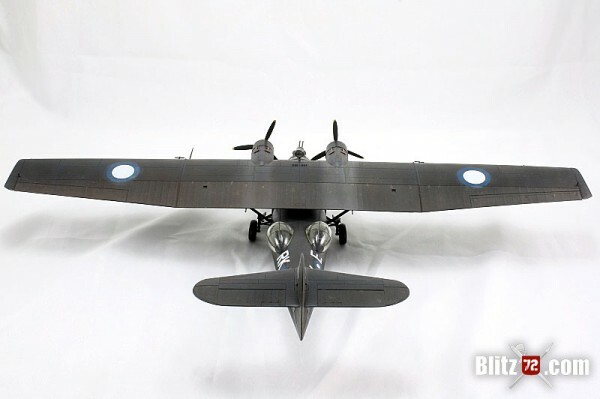 42 Squadron RAAF… the same flown by Flt Lt Harrigan on its final mission of Jan 15th, 1945. 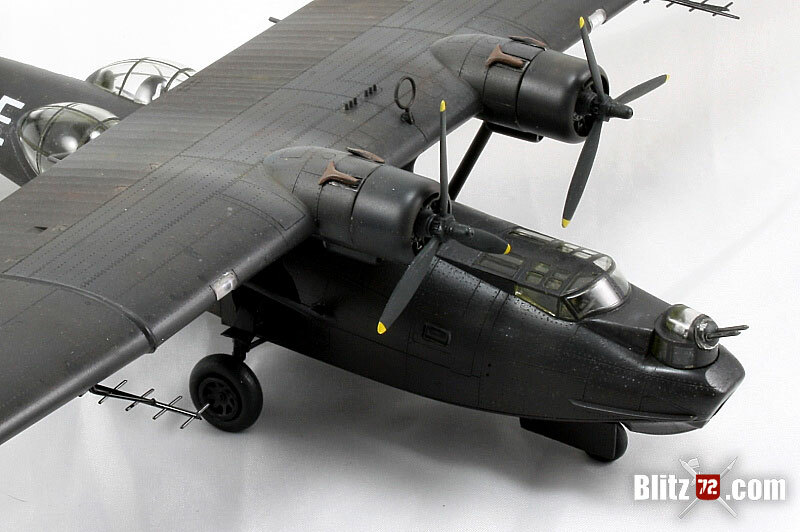 For this build he used Academy’s 1/72 PBY-5A Catalina kit. 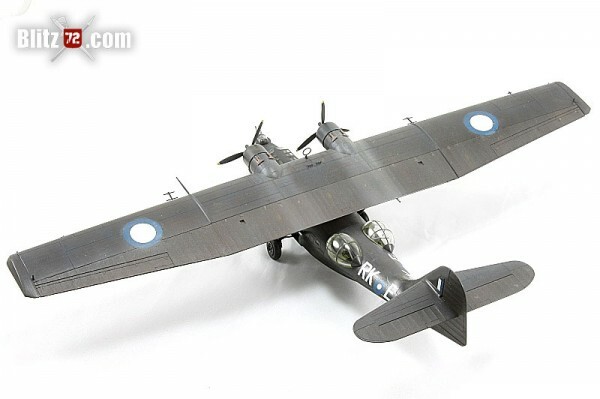 The model was painted with umber mixes of Black, Red Brown and Blue Angels Blue. I’m definitely going to try these mixes out as I think the colour is spot on. Further weathering was achieved with buff and light grey and a filter of oil paints to add further localized wear and staining. 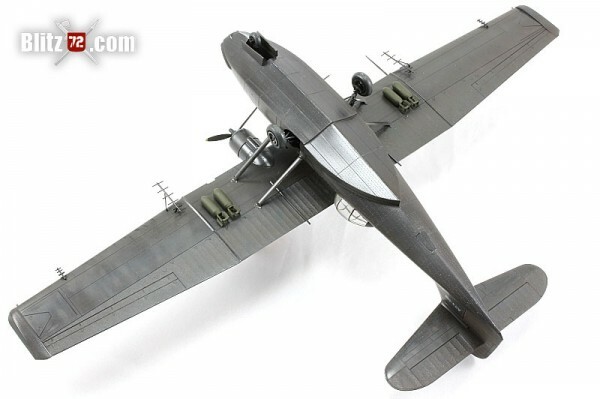 I don’t know about you guys, but black schemes are some of the most difficult ones to weather for me and I think Graham just did a master class on this Catalina. I have been hearing nothing but great comments on Academy’s Catalinas and Graham only make my urge to go and get one today by adding “A great kit that almost made itself, it fell together so well”. 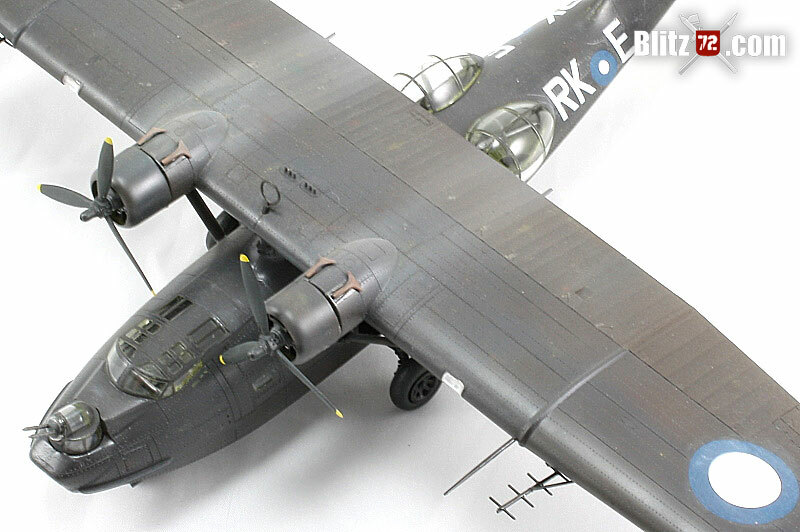 I can’t ask for more… a good kit of an iconic and very important aircraft of WW2, a very interesting history behind the actual plane being modelled and last, but surely not least, the skilled hands of the modeller. 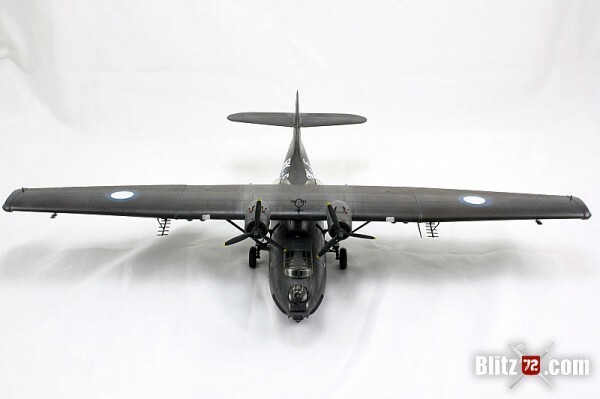 Graham Mahoney lives just outside Melbourne in Victoria, Australia where he is a member of the Pakenham Modellers Group. Graham first became interested in modelling whilst growing up in the UK, then ‘life’ got in the way. 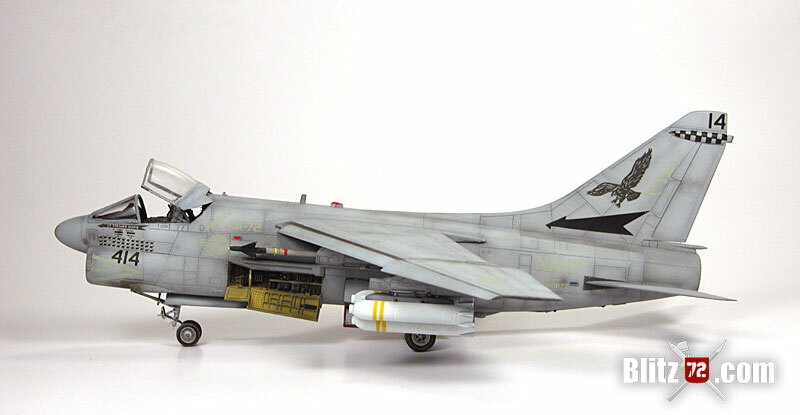 He has been back in the hobby for close to 10 years now and mainly build in 1/48th now, although will throw the occasional 1/72 plane – or 1/20-1/24th scale vehicle into the mix. Hi, This is nice looking model and a terrific story that goes with it. My Grandfather (Ronald Patterson Condie) served in both #42 and #43 squadrons during the war as a navigation officer, he was in #42 squadron at the end of the war and was involved in the repatriation of POW’s from Manila, he was on board Catalina A24-365 on the night of 11/10/1945 when it went down. He was one of the survivors and only recently passed away. OMG Andrew, it is great to read you and learn about your grandad. I’d say get the model, if someone in the world has to have that it is you :D. IF you need any help at all don’t hesitate contacting me about it. Again, it is great hearing (reading) from you and your grandfather! For the Cat Boats are flying to-night. Hi,I log on to your blog named “Modeling a RAAF PBY-5A Black Cat in 1/72 | Blitz72.com” on a regular basis.Your writing style is witty, keep doing what you’re doing! And you can look our website about love spell.